Nacházíte se: Booktook.cz → Odborná literatura → Cizojazyčné → Zobrazovací metody → MRI at a Glance, 3rd Ed. 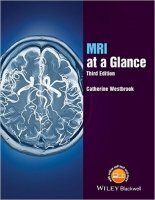 MRI at a Glance, 3rd Ed. MRI at a Glance encapsulates essential MRI physics knowledge. Illustrated in full colour throughout, its concise text explains complex information, to provide the perfect revision aid. It includes topics ranging from magnetism to safety, K space to pulse sequences, and image contrast to artefacts. This third edition has been fully updated, with revised diagrams and new pedagogy, including 55 key points, tables, scan tips, equations, and learning points. There is also an expanded glossary and new appendices on optimizing image quality, parameters and trade–offs. A companion website is also available at www.ataglanceseries.com/mri featuring animations, interactive multiple choice questions, and scan tips to improve your own MRI technique. MRI at a Glance is ideal for student radiographers and MRI technologists, especially those undertaking the American Registry of Radiation Technologist (ARRT) MRI examination, as well as other health professionals involved in MRI.